Complaints. Are they uplifting or degrading? Do you brush them off your shoulder and go on as if nothing has happened? In legal terminology a complaint is a formal legal document, but it has happened once or twice that complaints come forth at the Duck and Cherry without having a trace of legality or even being sound enough to be documented. My father would never let us complain about the food. He said we should be grateful for the food we had every day. And right he was. But there are a few other things family members could complain about, no doubt. I believe that a positive attitude will swipe away some complaints. Not all are necessary and important enough to be aired out in the open, causing conflict or hard feelings. After all, complaining is simply expressing dissatisfaction and annoyance - grief, pain, or discontent are other words that come to mind. Complaining about the weather, for instance. Is that necessary? Can we really do anything about it? Complaining about what's for dinner? Mom's in charge. She decides. Complaining about doing the dishes? Now that one is a current happening at the Duck and Cherry. Our dishwasher has been broken for several weeks and I do the dishes by hand. I really don't mind too much, but I am looking forward to a new machine. Sometimes I turn to complaining if I want sympathy. Maybe it's a girl thing. It just happens. 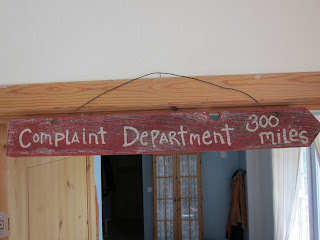 So, a few weeks ago on our trip to Amish country I picked up the sign Complaint Department 300 miles. 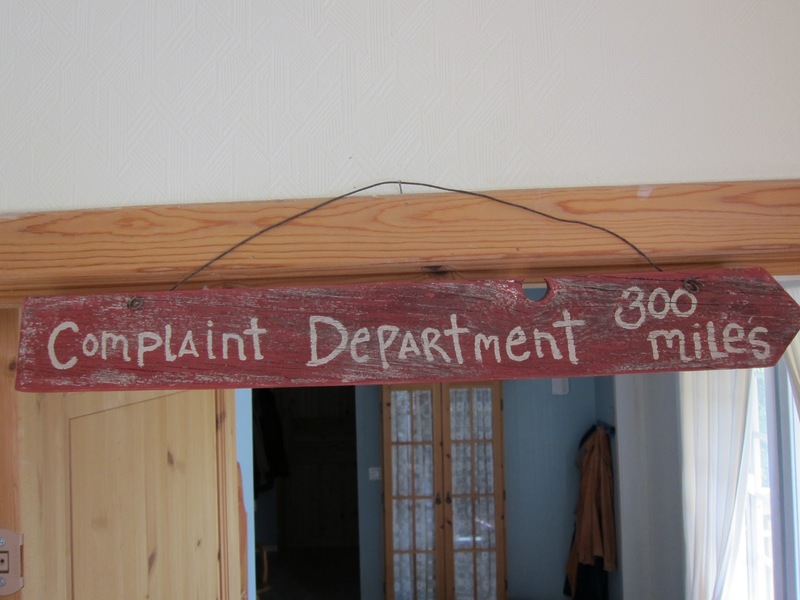 It is now hung above the kitchen door showing the direction and distance anyone will have to walk in order to place a complaint. Arnfinn suggested that I can change the direction after a while. 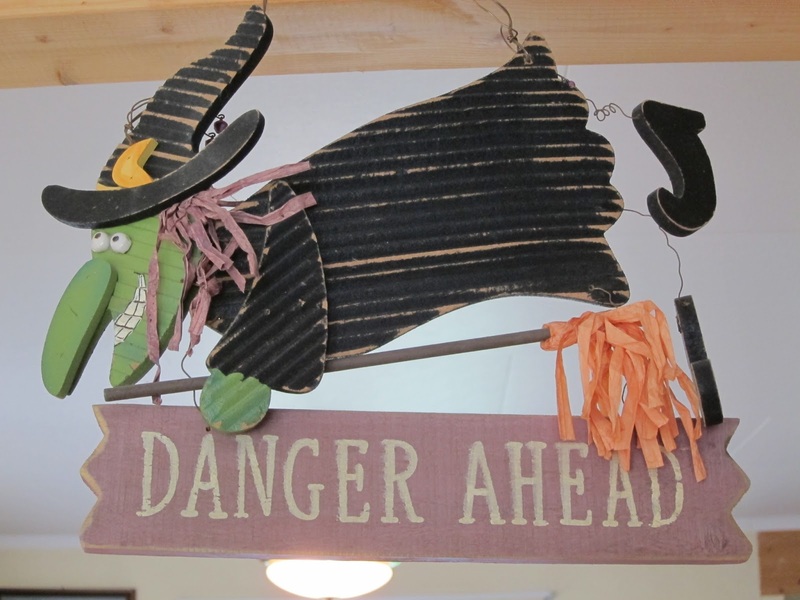 Another sign I have hanging from a beam in the kitchen is the witch sign warning Danger Ahead. I am not really sure which danger I am talking about, but I like it anyway. If there had not been a witch accompanying the warning it would not have hung in my kitchen.